"Nothing is perfect…We're really more interested in what we're saying than how we're saying it." A recent interview with Neil Young discussing his newest album "Peace Trail" released last week (reviews). MJ: In the song "Can't Stop Workin'," you sing that work is "bad for the body but good for the soul." What's hard for you? NY: I think it's the constant work; performing and traveling. It gets to be a bit of a strain. But if you pace yourself, which I've managed to do, you can go pretty well. And now I'm at a point where I decided I'm going to be in the studio for a while, at least until I finish this record I'm working on now. I should have two, three, four of the sessions that I had that were similar to the sessions for Peace Trail before I have a complete record. But I'm off to a good start and it may happen faster. Who knows? MJ: I had an unsettling feeling that the purpose of my own work as an artist should maybe change after this election, but I'm unsure how. You've lived through really turbulent times and have written some very powerful protest songs—"Ohio" and "Southern Man," for example. So how do you view the responsibilities of being an artist in the years to come? NY: This time is very similar to the '60s, as far as I can tell. The artists always reflect the times, so there's a lot to think about, a lot of unknowns, a lot of things that are describable. This is the closest I've seen to the kind of ambience that made the '60s happen. It's not about the artist having a responsibility to do anything. They have to be artists and express themselves and everything will work out fine. It's all going to be great. The youth of this country are not behind what is going on. We all know that. If you looked at a [political] map of the United States 25 and under, it's all-revealing. It's a unified map. MJ: What scares me is this rift in our understanding of one another. You have viewpoints so far apart, so colored by anger and frustration, that it's very hard to find common ground. Do you have thoughts for how we might connect? NY: It's gonna happen. We had the Vietnam War in the '60s, and there was a draft. The students didn't believe in it, and it unified them. That brought the people together and made the '60s like they were. The youth were very unified against the status quo—against the old line and the new old line. It's the same exact thing today. Social media and young people, art, music, all communications make this one of the most active times for activism. It will be a time of change. "Standing Rock is a moment in history. We really have to grab it and go with it." MJ: Speaking of activism, there's your new song "Indian Giver," about Standing Rock. What's your view on the standoff? NY: It's injustice. It's wrong. [The pipeline companies] didn't get the permission. They didn't do the things they should have done in the first place. They tried to just bully their way through there and they got stopped. But they're not really stopping. MJ: It's become a new point of reckoning in the history of how Native Americans are treated. NY: Five hundred years later we're still doing it. This is a moment where we're either going to reaffirm that's what we do, that's who we are, or we're going to start moving toward change. A change won't come easy, because there's a lot of big money that doesn't care about any of this. Standing Rock is the beginning of something. It's a moment in history. We really have to grab it and go with it. We may only be halfway through the actual "Standing Rock" part, [but] it's more than that—it's the lessons of Standing Rock, of what you can do. How much can you make change happen? How long can you slow things down? How much attention can you bring to things that are unjust, unfair, in many cases illegal? Just exposing it, that's the job of the social media, the musicians, the people who care, the real protectors around the world. They don't have to be at Standing Rock. They just have to say they're with the people at Standing Rock, and tell other people that what's going on there is wrong. Learn about it. See what happened. See what they actually did. You won't see it on corporate media, you have to go to social media. These are not excuses for "weak lyrics". These are the facts as to why. Neil's just not there these days. Full interview with Neil Young on Mother Jones by Jacob Blickenstaff. 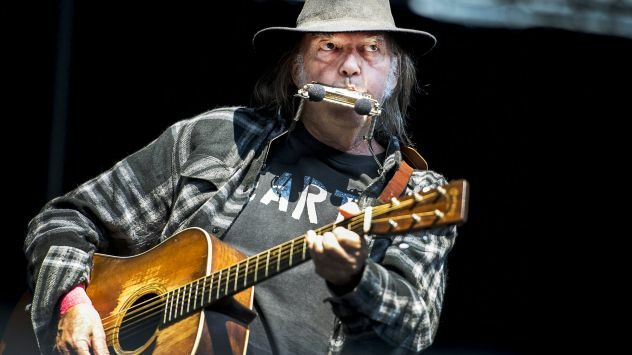 Also, see reviews of Neil Young's newest album "Peace Trail" released last week . "And now I'm at a point where I decided I'm going to be in the studio for a while, at least until I finish this record I'm working on now. I should have two, three, four of the sessions that I had that were similar to the sessions for Peace Trail before I have a complete record. But I'm off to a good start and it may happen faster. Who knows?" Peace Trail has been quite an easy album to digest compared to many of his recent efforts. So I am ready for another new album! Yes bring it on Neil! Matt B, I'm Canadian but to me "hit the trail" means to get on the trail. So maybe we should all be jumping on the Peace Trail. And the peace pipe for that matter too. That's the source of my doubt!